If you're subscribing for the first time, you should receive your first issue within 3–6 weeks. If you subscribe during the summer months, of course, our next issue might take a little longer than six weeks, so we usually send out our Winter issue to new subscribers so they don't have to wait until the next Buyer's Guide comes out. 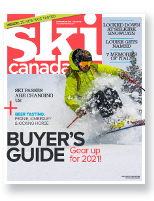 Whatever the season, renewal orders always start with the first issue after expiry—assuming you don't wait until the party's over before renewing (in which case we'll send you the issues you missed, if they're still available).